The Advancement Department oversees Communications, Alumni relations and Fundraising. St. Thomas High School has thrived for 118 years because generations of our alumni, alumni parents and friends have supported the mission of the Basilian Fathers. The Advancement Department will continue to keep you informed about all things St. Thomas, bring our community together for fellowship and fun and endeavor to provide the best educational experience for current and future students. The 4500Forever Capital Campaign was launched in November 2013 and STH developed a new strategic plan, creating its roadmap for the future. The strategic plan priorities can be summarized as follows. Your ability to support St. Thomas is just a simple click away. However before you give, “Thank You!” Your support touches so many aspects of the school and the lives of so many students in a positive way we just wanted to take a moment to express our appreciation. Pavers for the St. Thomas Courtyard are always available for purchase. Many purchase pavers in April or May in honor of their graduating senior; others purchase in memory of or in dedication to a family member, dear friend, or a "class of." 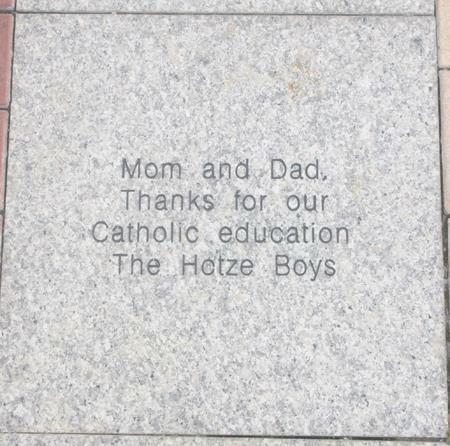 A brick paver is a wonderful keepsake to honor those with ties to St. Thomas, and to support a school that for over a century continues to greatly impact the lives of all young men who pass through its doors. To place your brick paver order, simply download the Brick Paver Order Form, complete it, and mail it along with payment to the school as indicated on the form or click here to order your paver online. For questions or more information, contact the Advancement Office at 713-864-6348. St. Thomas High School is very fortunate to have constituents that realize the importance of financial aid. We have more than 80 named scholarships, funds endowed by donors, for the sole purpose of tuition assistance. For more information on how to set up a named scholarship or how to contribute to existing scholarships, please contact Mark deTranaltes '83 at 713-864-6348 x 155. Many employers sponsor matching gift programs and will match any charitable contributions or volunteer hours donated by their employees. To find out if your company has a matching gift policy, please enter your employer's name below. If your company is eligible, request a matching gift form from your employer, and send it completed and signed with your gift. We will do the rest. The impact of your gift to St. Thomas High School may be doubled or possibly tripled! Some companies match gifts made by retirees and/or spouses. Recognize a family member or a friend with a gift to St. Thomas High School In Memory Of or In Honor Of that person. You could never have planned what St. Thomas would give you. But you can plan how to give back. Include St. Thomas in your will or estate plans, and you’ll create a lifetime of memories for future generations of Eagles. With some very simple steps, you could give a gift that meets the needs of your family AND makes the St. Thomas experience accessible to young men down the road. What will your legacy be? Shopping Can Be Rewarding for STH! AmazonSmile: Amazon will donate 0.5% of the purchase price of literally millions of eligible products to the non-profit organizations designated by their customers. Enrollment takes just a few minutes. Go to the AmazonSmile website to select St. Thomas High School, Houston. Once you have registered, start your shopping from the AmazonSmile website to accrue rewards for St. Thomas every time you shop at Amazon. Kroger Community Rewards: This is a new program and you will need to re-register after August 1 each year, but luckily, they have made that process quick and easy. Go to the Kroger Plus Card website and follow the prompts to link your Plus Card to St. Thomas High School, organization #81477. Once enrolled, every time you shop using your Kroger Plus Card, STH will accumulate rewards. Target Take Charge of Education: This program has benefitted St. Thomas since 1999. Those of you who have Target REDcards, please consider registering at target.com/redcard. Select St. Thomas, school ID #16264. The school will receive donations of up to 1% of your total REDcard purchases at Target stores in the U.S and at Target.com. Click here to view the Round Up page. The Style Show luncheon has been a longstanding STH tradition for 48 years. It’s a time when the Senior boys are able to showcase their interests; be it leadership, sports, theatre, band, hobbies, etc. – you name it!! All Senior Moms are encouraged to take part in this fabulous event by modeling the newest Spring fashion styles chosen by our fashion coordinators! Biographies of each of the Senior boys are read aloud allowing us a glimpse into their STH lives. Get a tissue! You will definitely shed a tear and crack a smile when letters written by the boys to their moms are read aloud…..all while presenting their dear moms with a rose! It is a truly touching event that you will not want to miss!! To wrap things up, the almost graduated Seniors take the stage grinning from ear to ear, donning baseball caps from the university they will be attending.